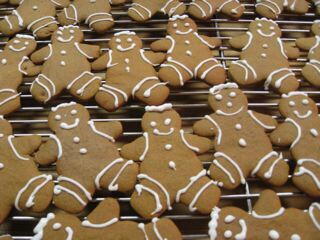 One of the traditions in my kitchen each Christmas season is the baking of gingerbread cookies. They are my daughter, Beth’s, favorite and a sweet reminder of childhood. When I make them the whole house is permeated with the soothing smells of cinnamon, cloves, ginger and molasses. As I play Christmas music, make the dough, roll it out and use the well worn gingerbread man cookie cutter, I wonder where all those years have gone, and I wish that my children were here to make these cookies with me. Now it seems a lonely process, but once they are baked and I decorate what seems like an army of them with smiling faces, I am content in knowing that even as adults, my children will have lasting Christmas memories when gingerbread cookies appear once again this year. Sift the flour, soda, baking powder, ginger, cinnamon, cloves, allspice, white pepper and salt together on a sheet of wax paper or in a bowl. In a stand mixer or with a hand held mixer cream the sugar and butter until smooth and creamy in a large bowl.Beat in the egg and molasses. Slowly beat in the flour mixture until well blended. Transfer the dough to a sheet of wax paper; cover and refrigerate at least an hour or two. Divide the dough into quarters and roll each one out on a lightly floured board. Use your favorite gingerbread cookie cutter to cut out shapes. Place the cookies on parchment lined baking sheets at least 1 inch apart. Bake in a preheated 350F oven for 10-12 minutes our just until set. Transfer the cookies to a cooling rack. Frost them with confectioners icing or leave them plain. These will freeze well layered in tins or tupperware containers with sheets of wax paper between the layers. These are the best cookies! Maryann, lets say we are preparing them and find out that I am lacking a few of the spices like cloves. Is there a nything else i could use as a sub? I smiled when I read this post. I just pulled out my Christmas Cookie cutters, and I reminisced abou the times when I had flour all over the kitchen because I had so much help. My exercise friends--mostly non Italian--wanted to go to an Italian chain tonight. I don't know if they understand my need to stay home and prep myself to make pizzeles in the a.m.
My children are adults, and my son live on the other side of the country. I need to bake, so I can send a care package of cookies and other Italian goodies.